Two giant steps for Hardy County were made at University of Charleston’s Laidley Field as East Hardy pounced to a boys shuttle hurdles bronze medal and SierraMarie Miller cleared the high jump bar for a sixth place medal during the 104th Boys and 44th Girls WVSSAC State Track Meet and the Yellow Jackets buzzed near medal contention last weekend. The state track meet featured 1,883 athletes representing 112 schools with Hardy County competing with a combined 32 athletes creating an adrenaline packed competition. Departing Hardy County in the rain, the track athletes arrived to clear weather and didn’t have to worry about dashing through rain at the meet until the final 4×400 race had a brief downpour delaying the event slightly as runners hurried underneath tents for shelter. For the first practice session at the state meet, Moorefield Boys squad donned superhero shirts and the coaches had their own to inspire a fast and strong competition. Prior to the first state track meet event on Friday afternoon which was the 4×800 relay, the Yellow Jackets took time to stretch and soak in the experience moving around the track and raised the Moorefield flag to boost the team spirit with blue skies above. The national anthem was sung by a student from Charleston Catholic. Both Moorefield 4×800 relay teams reduced the times from the regional placement as the boys cut down seven seconds and the girls improved by five seconds. The Moorefield Girls 4×800 relay squad of junior Morgan Armentrout and seniors Desirae Morris, Shyanne Whetzel and Brooke Ketterman had the season’s fastest time of 12:10.65 which landed for 12th overall. “The state track meet was a great experience and I can’t wait to go back. 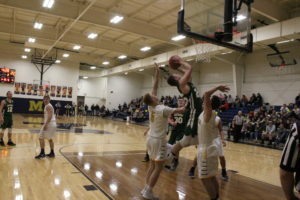 Unfinished business,” Moorefield sophomore Jackson Weese posted on Twitter. The Moorefield Boys 4×800 relay squad of sophomores Jackson Weese and Matthew Weatherholt, plus juniors Benjamin Pyles and Matt Wright huddled together for a prayer before the race, then completed the event in a time of 9:29.72 for 15th place. “The 4×800 and the 4×100 had their PR today, so that was great. 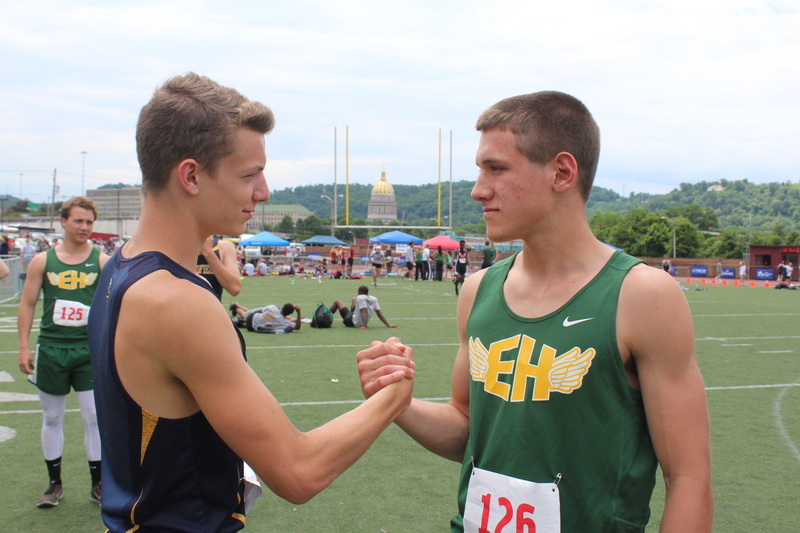 The 4×800 will all be back next year,” Moorefield Boys Track Coach Barbie Stickley noted. Moorefield junior Hope Aristidou was grinning as she approached the starting area, then adjusted her eyeglasses looking over the hurdles before improving her time to 17.71 for the 100 meter high hurdles preliminary round resulting in 11th place which was personal best. “That was a good race. 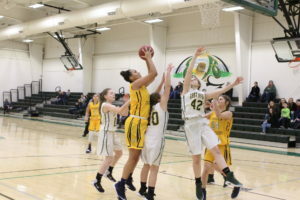 I hit everything, but it was fun,” Moorefield junior Hope Aristidou noted. Aristidou nudged the hurdles during the race, but remained focused. East Hardy’s Drew Kelican and Adam Larson did some sideways kicking exercises before being called to the 110 meter high hurdles preliminaries event. Larson shaved some time off the 110 meter state high hurdles from regional to earn 14th place with a time of 17.68. Kelican was on pace with two of the competitors, but one jarred his hurdle near the end of the race causing Kelican to push down on the hurdle with his foot and was caught from the back as the hurdle flipped down sending him crashing to the track. Kelican got up to finish the race, but not before being disqualified for pushing the hurdle. East Hardy freshman SierraMarie Miller was warming up for the state high jump event as the hurdles races came to an end and took some advice from coach Monica Combs prior to taking the steps to the launching spot. 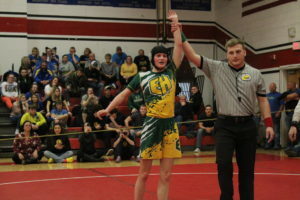 Miller has a wicked strong work ethic having competed as a wrestler and entered the state track meet qualifying in four events: high jump, 4×100, 4×200 and 4×400. Miller tied for sixth place in the high jump at a height of 4’8” to earn her first career state track medal and the only points for the Lady Cougars. “I’m real excited to compete in all four events as a freshman,” East Hardy freshman high jump medalist SierraMarie Miller remarked. Miller had a huge smile as she put the medal around her neck and gave Coach Combs a hug. “I’m very proud of my freshman who came in four events and medaled in her first event here. But she is right, the expectation is not sixth place now, it is higher than that,” East Hardy Girls Track Coach Monica Combs stated. The next track event was the 100 meter dash time trials led by defending state champion senior Freddy Canary of South Harrison, who qualified for the finals in a time of 10.85 and went on to win the gold medal at 10.99. East Hardy senior Phillip Mullin in his first track season after participating in baseball in previous years, punched a ticket to three events including the 100 meter dash, 4×100 and 4×200. Mullin finished in 13th place with a time of 12.12 in the preliminaries, missing the cut by .46 seconds. “I joined track to have fun and it turned out to be pretty good at it. These guys were really fast. Track is serious, you have to be ready to run,” East Hardy senior Phillip Mullin said. A scary moment happened as a Doddridge County pole vaulter came crashing down off the mat landing on his head and was sent to the hospital for medical treatment. As the meet continued, it was time to see the Hardy County Girls shuttle hurdles teams and East Hardy Boys compete. Moorefield Girls shuttle hurdles crew of sophomore Sydney Gribble and juniors Morgan Armentrout, Allyson Loften and Hope Aristidou set a personal record time of 1:12.91 finishing in seventh place which just eluded grasping a medal by three-tenths of a second (.36) behind Magnolia. “The ladies made great effort. Half of them are first time participants of the state track meet,” Moorefield Girls Track Coach Vivian Carr remarked. East Hardy Girls shuttle hurdles team of freshman Rayne Metzer, senior Holly Williams, senior Summer Funkhouser and sophomore Jaden Fleshman took 10th place overall in a time of 1:16.42 which was a second better than regionals. In the boys shuttle hurdles, the Cougars quartet of junior Adam Larson, senior Drew Kelican, freshman Bryce Tharp and junior anchor Chance Dove finished in a time of 1:02.86 garnering a third place medal. “I’m extremely proud. It has been a long time coming. We came down here last year and missed it by three-tenths of a second and I bet they remembered that,” East Hardy Boys Track Coach Devon Orndorff commented. The bronze medal win was an exciting accomplishment and a good highlight for the state meet. “It means a lot, but we’re all a team. It’s not just me,” East Hardy junior Adam Larson remarked.